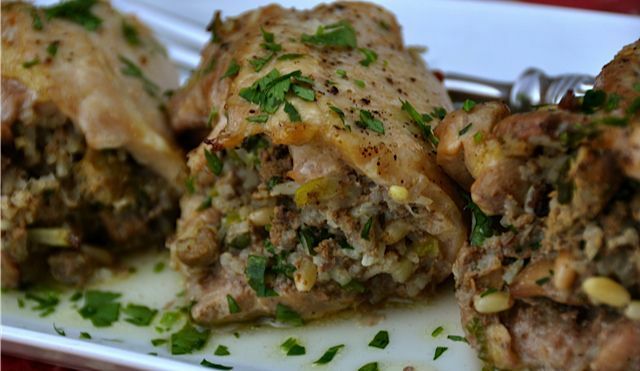 In this recipe, boneless chicken fillets are stuffed with a combination of chicken livers and rice and flavored with plenty of scallions and toasted pine nuts. The chicken is then baked with a bit of white wine and the end result is moist and flavorful. Add the chicken livers and sauté until all the pink color disappears, about 10 minutes. While the livers are cooking, use a wooden spoon to break the pieces down into smaller pieces about the consistency of ground beef. Add the green onions and sauté until tender, about 5 minutes. Add 1/4 cup white wine to pan to deglaze and then add toasted pine nuts, parsley and season generously with salt and freshly ground black pepper. Continue heating another 5 minutes for flavors to meld. Remove from heat and stir in the cooked rice to the mixture. Lay a piece of chicken with the “skin” side down. Place approximately a 1/4 cup of stuffing mixture on one half of the chicken. Fold the other half over to cover. Note: If you are using chicken breasts and the pieces are larger, you may need to roll the cutlets into logs around the stuffing and secure with toothpicks. Chicken thighs tend to be smaller and will only make a single fold over the stuffing mixture.